This is such a quaint Antique Easter Card. 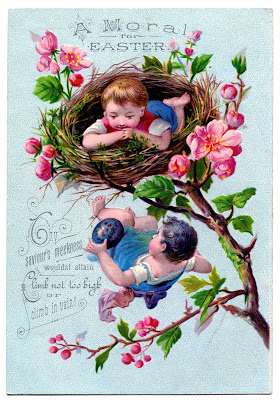 The card shows 2 children, one inside of a Bird’s Nest and one falling out of it, after stealing an Egg! I love the colors and the pretty Blossoms! 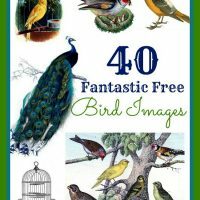 40 Best Free Bird Images!! Antique Feathers Image – Pretty! Vintage Child in Red Jacket Holding Grapes Trade Card Graphic! soooo soooo sweet…love the little nest…. I really love the nest, Karen. As always, you have wonderful images to share. Blessings to you and yours! Last week I sewed a lovely envelope for a good friends birthday, I’ve found a nice motive here. Thanks for sharing ! I’ve taken your link picture in my side bar. That’s very cute and I like the wording on it too! The colours are incredible I love it.